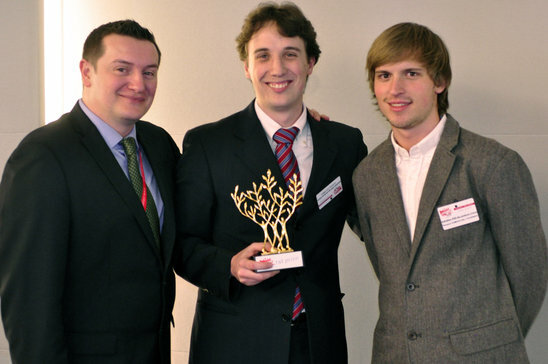 On April 20 and 21, Patrice Camus, Jonathan Colombo and Renaud Dumouchel- Fournier took first place in the finals of the prestigious international Citizen Act competition in Paris. Speaking to a jury of Société Générale professionals and executives, the three students had to present a novel project to improve business practices, based on principles of corporate social and environmental responsibility. The team proposed a unique project that Renaud Dumouchel-Fournier describes as a “platform for effective communication between the bank and its investment clients.” The platform allows the bank to develop investment products in which social and environmental responsibility is key to the solutions suggested to clients. “It was a real challenge,” admits Jonathan Colombo. “We had only 15 minutes to summarize a project that it had taken us months to develop.” The team also stood out because of its highly professional approach. According to Patrice Camus, “The judges appreciated the complete offer of service we submitted. It didn’t look anything like a student project.” The jury members also said they were impressed by the feasibility and profitability of the project, a fundamental aspect that allowed the three students to grab first place. Société Générale will be awarding the winning team a prize of 5,000 euros, but the three students don’t intend to rest on their laurels. “We are looking to the future now. Our goal is to make this proposal a reality. Our time in Paris gave us a chance to make connections with industry leaders, and the support they expressed for our proposal is encouraging us to continue,” says Patrice Camus. The team wishes to thank Professors Emmanuel Raufflet, Luciano Barin Cruz and Luc Brès, members of the Interdisciplinary research group into sustainable development (GRIDD-HEC); and Professor Réné Gendreau, Pierre Batellier (Sustainable Development Co-ordinator at HEC Montréal), Suzanne Laberge and Sarine Chitilian (Société Générale), for their invaluable contributions. HEC Montréal congratulates the Génération RSE – Les porteurs d’espoir team for winning such a prestigious international competition as Citizen Act, and wishes them every success in making their plans a reality.